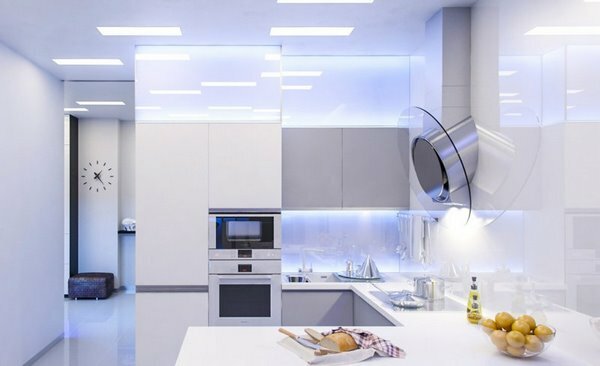 We will have a close look at some of the top high tech kitchen design trends and will show you amazing interior designs which feature the latest technologies offered by manufacturers. What is high tech style? What are its most typical features? High tech style originated at the end of the 20th century and is one of the most interesting styles in interior design today. It is based on the design of industrial premises, where all elements have to meet the requirements of functionality. In residential areas, the elements with industrial visual aesthetics have found their place in contemporary styled homes and in minimalist interiors based on simplicity and strict elegance. What are the main features of high tech interiors? Minimalism – this is one of the most characteristic features of high tech style. Simple lines and geometric forms are typical for the decor. Color palette is based on neutral colors like black, white, silver and gray, rarely dark browns, which complement the extravagant atmosphere. Minimal decor and lack of accessories – light fixtures with unusual shapes, for example, can be a stylish decor. 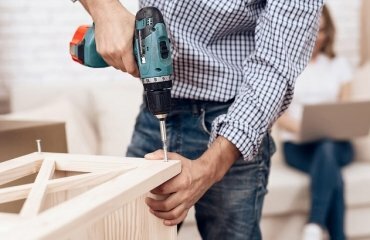 Modern materials – initially, this style was based only on plastic, metal, artificial stone and glass but one of the latest trends is to add wood and natural stone to hi-tech interiors. 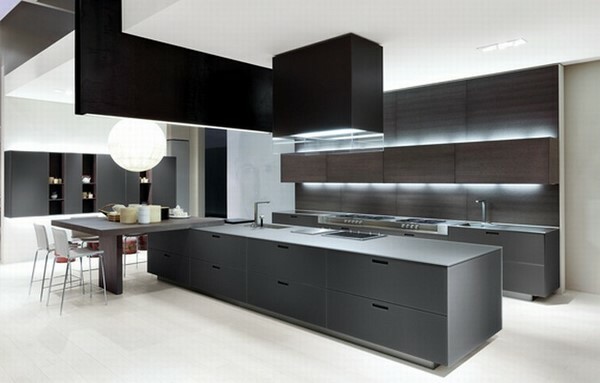 The key feature of high tech kitchen design trends is the unobtrusiveness and the sense of efficiency. 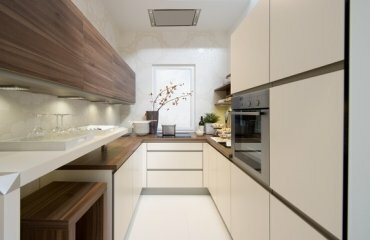 Those who prefer a cozy “grandma-style” kitchen, full of ceramic dishes, baskets and pots and pans displayed on open shelves, should forget about high tech style. 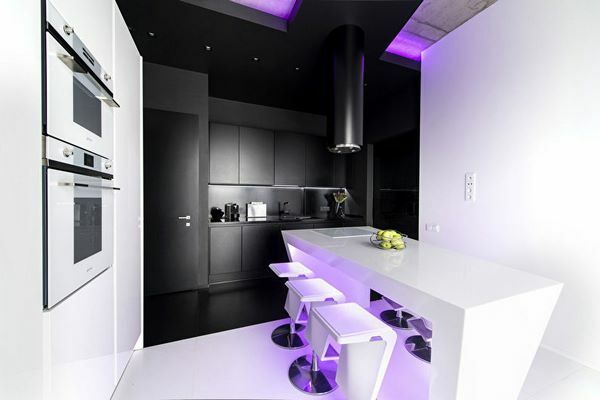 The choice of colors of the kitchen is very important. 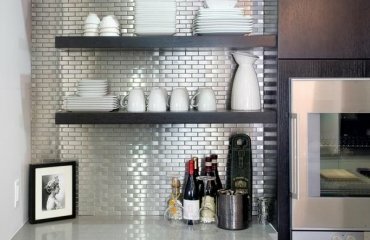 Typically furniture and cabinets are glossy and the abundance of metal and reflective surfaces allows only one bright color as an accent. 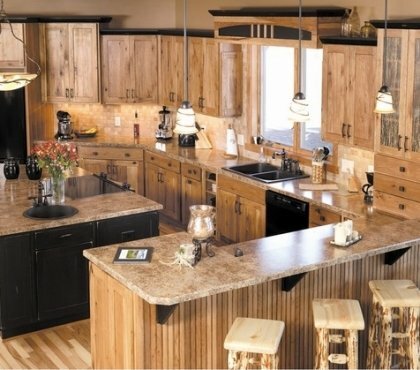 Otherwise, you risk turning the kitchen into an eclectic room imitating high-tech style. Innovative high-tech materials are often used for the furniture. These modern materials are easy to clean and maintain, they are resistant to corrosion, high temperature, aggressive household chemicals and mechanical damage. 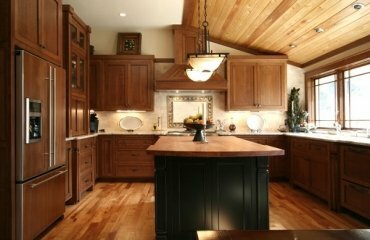 As easy as maintenance is, you need to keep in mind that only a spotless kitchen is pleasing to the eye. 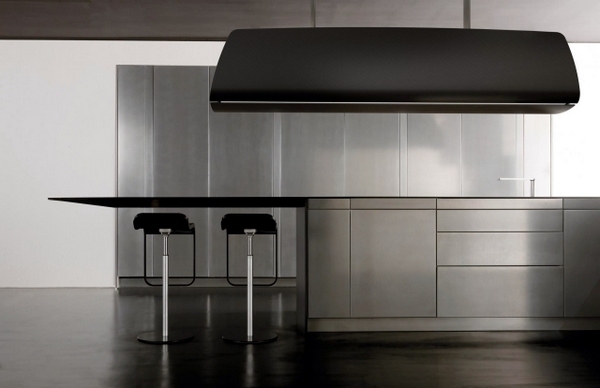 High gloss and metal surfaces require special care to keep their sleek appearance. Furniture should be modern, functional and embody the basic principles of style. 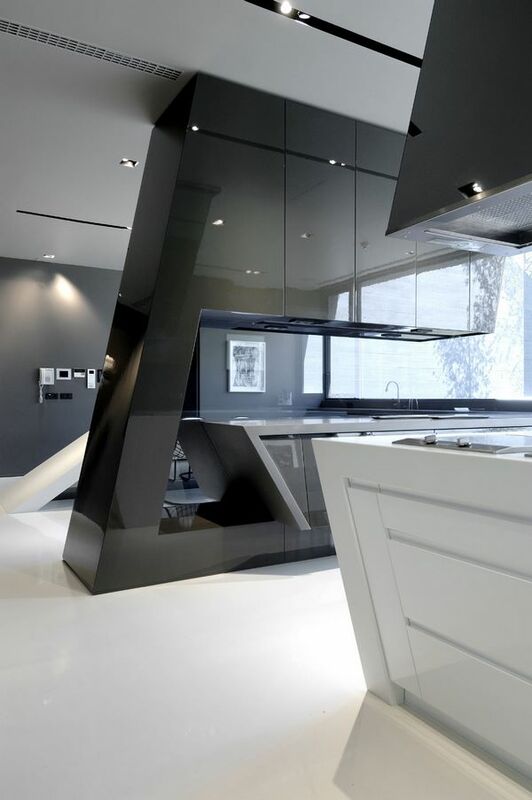 Cabinet fronts are smooth and dining furniture should be chosen with respect to the futuristic atmosphere of the entire interior. A transparent table and designer’s chairs will be a great addition. Appliances like refrigerator, dishwasher, washing machine, microwave, oven, coffee machine must be built in or stored neatly in the cabinets. You have to keep in mind that such kitchen interiors will look organic in a home where the design concept unites all the areas. 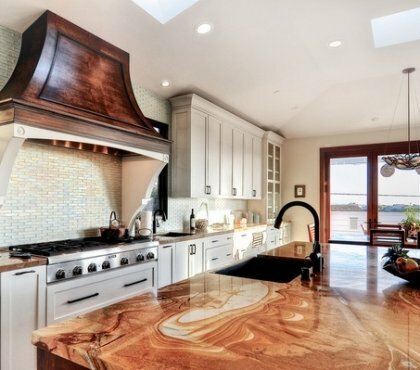 Do not try to create a high-tech kitchen if the rest of the home is decorated in classic or Provencal style. 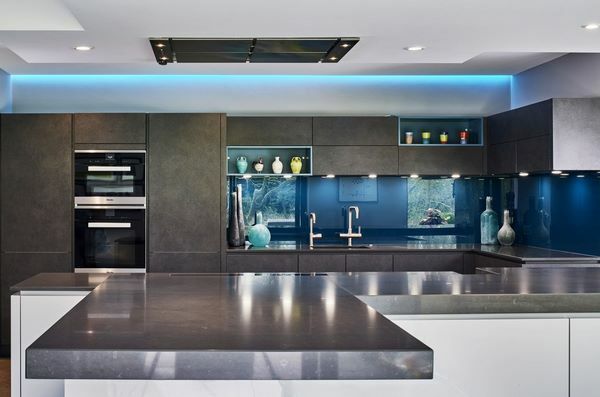 Lighting is another essential element of high tech kitchen interiors. 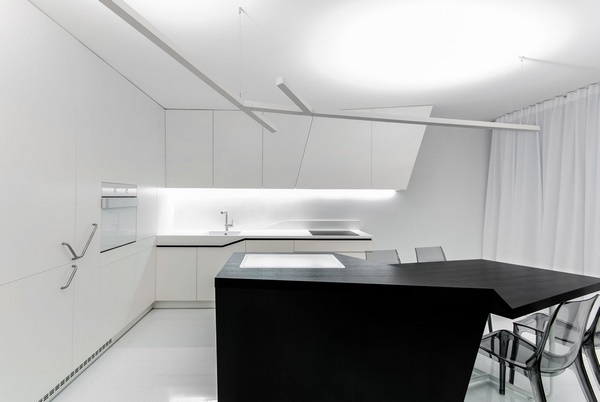 Combined lighting s often used to create an effect of spaciousness and accent on furniture and appliances. Natural light, spotlights, string lights and of course, LED lights create exceptional visual effects. Often LED lights are hidden in crown moldings or underside of cabinets and the variety of colors enhances the futuristic atmosphere. 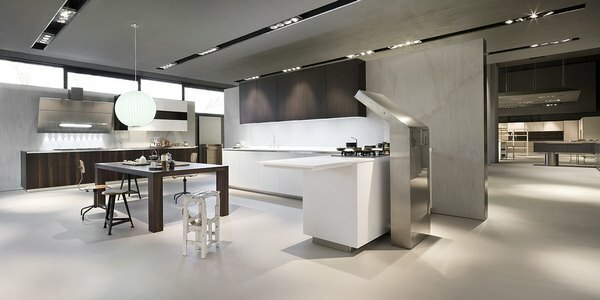 As we mentioned, high-tech is the style for those who love minimalism in everything and in every detail of the interior. 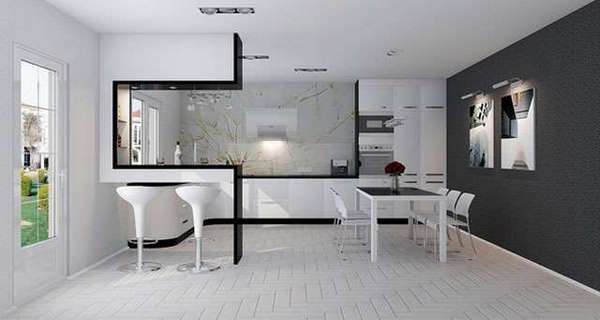 Kitchens are designed with clear edges, strict transitions, straight lines, and simple geometric shapes – circle, square, rectangle, cylinder, etc. 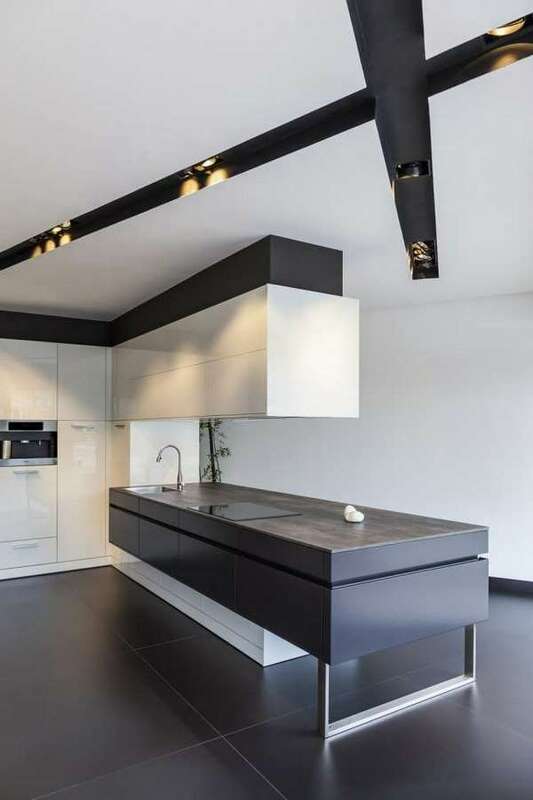 High tech kitchen design trends are aimed at the ergonomics and functionality of the modular and built-in furniture as well as minimum energy consumption of household appliances. Every detail of the interior, every item should be easily accessible and at the same time work with the concept of minimalism. 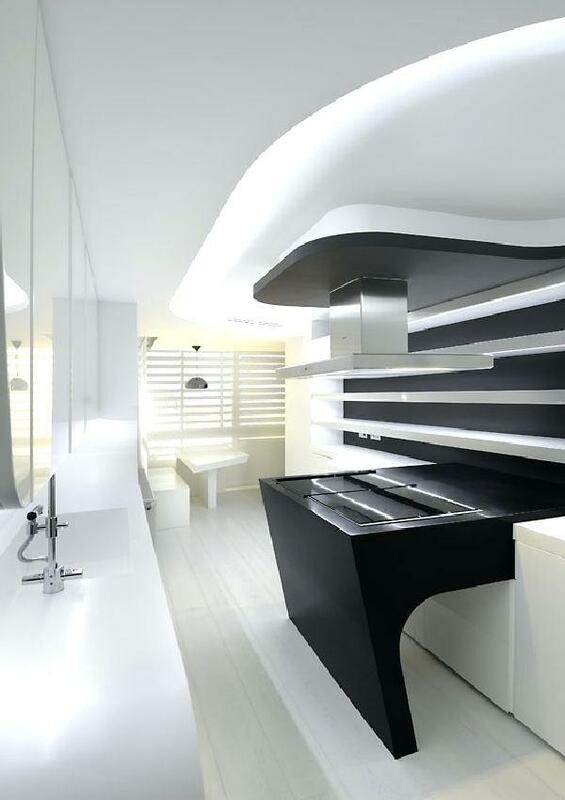 The available space is optimized and cabinets, many drawers, rotating racks, niches provide storage space for household appliances, cookware, tableware and cutlery so the eye is focused the strict lines of the interior design. Modern closing and sliding systems or hidden sections allow you to expand work surfaces and avoid “dead” zones. 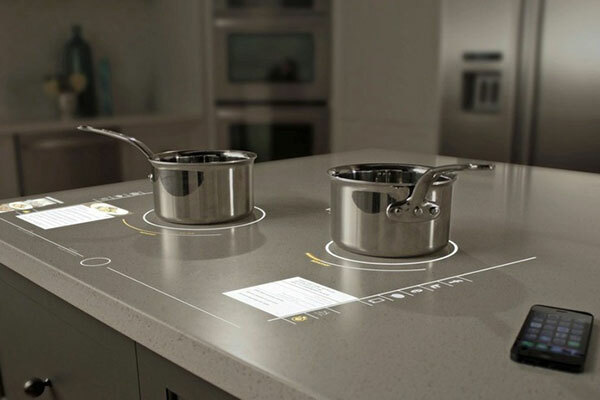 Multi-functional equipment and smart technology – this is one of the fastest growing trends in kitchen design and equipment. 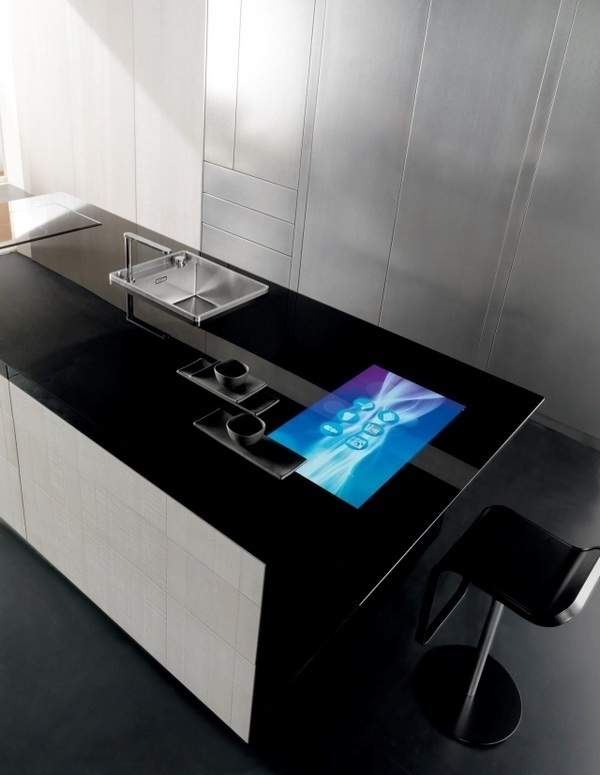 From spectacular interactive cooktops to wireless sound systems, from touchscreens to full-color screens, from handleless push-to-open doors to integrated app controls, all of these replace the conventional kitchen equipment. 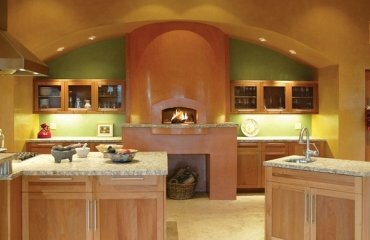 Resource saving is another growing trend in interior design and especially in high tech kitchens. Motion activated faucets are quite popular in public areas and now they find their place in residential kitchens. Their sleek design blends harmoniously with the minimalist concept of the style and homeowners enjoy their water-saving benefits. 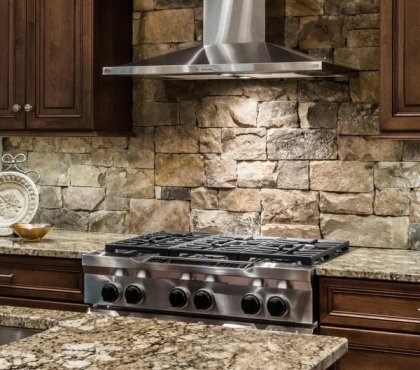 Energy-efficient appliances are a must in any high tech kitchen. Nowadays, manufacturers offer devices with monitoring systems for energy consumption which can detect electrical overload, even water failure which prevent losses and in this way protect the environment. 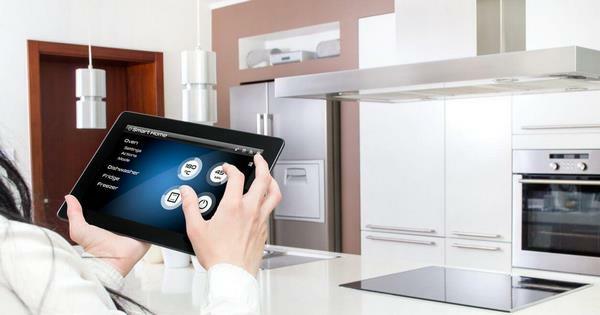 Remote monitoring sounded like science fiction while it is widely used nowadays and homeowners have the opportunity to monitor and control all their appliances while at work, on vacation or simply away from home. 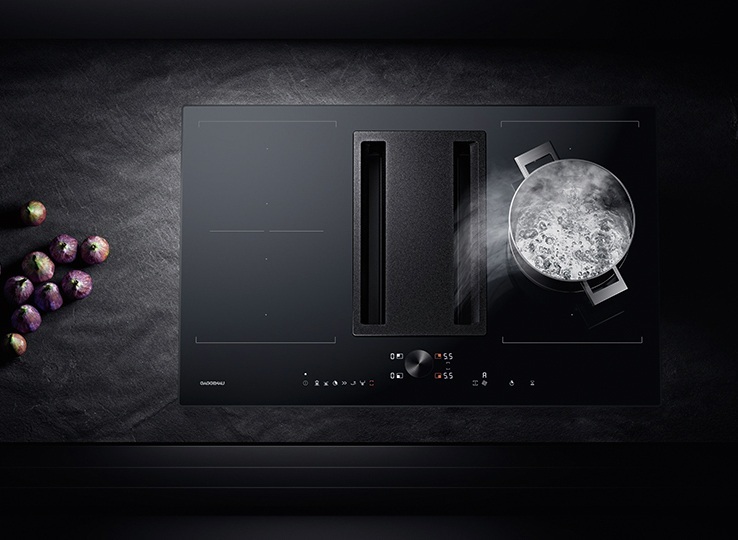 The cost is always an important factor and people who plan to have a high tech kitchen need to be prepared for a serious investment since latest technology does come with a hefty price tag. However, contemporary interior design and ultimate convenience will not only ease your daily life but add enormous value to your property. 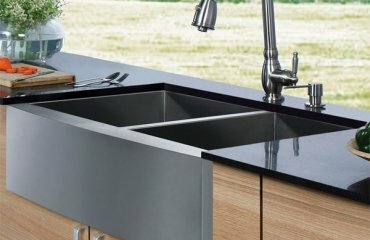 Thanks to the durable materials, you can be sure that your kitchen meets all modern standards of fire resistance, functionality and durability and will last for many years.